Feeling called to something greater? Ready for something to change in your life, but not really sure what it is? Enjoy the practice of yoga, and interested in learning more about it? 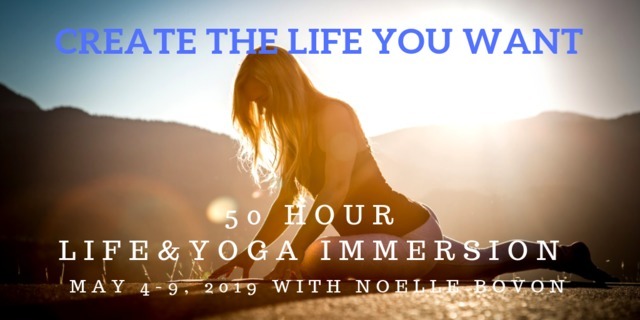 Join me for a 50hr Immersion called Create The Life You Want in Revelstoke May 4-9, 2019. This may be the last one I run for a year. A 50 Hour Yoga & Life Immersion designed to guide you into a greater understand of yourself & the ancient practice of yoga. Are you ready to step into the brilliance of who you are? To unclutter your mind and develop skills that allow you to find grace in your day to day, even when life turns upside down. In this course you’ll explore aspects of yourself, by stepping into the practice of yourself. Yoga means ‘Union’ :: Union to Mind, Body and Spirit. You will learn skills that will help awaken what you already know in yourself and discover ways to implement the ancient teachings into your modern day world. We will do a lot of self exploration with guidance and examine your current place in the world and where you want to move towards. With that insight we will work together to help devise a plan for your future and your heart. There will be some amazing guest teachers on this training, including a sound healing portion, dream work and holistic nutrition. Looking forward to you joining me.